A week of activities mark the end of the year-long celebration honoring the 200th anniversary of St. Rose Philippine Duchesne first coming to America in 1818. For more than a year, Duchesne Academy of the Sacred Heart has joined with other Sacred Heart schools from around the world in celebrating the 200th anniversary of St. Rose Philippine Duchesne's arrival in North America. The bicentennial closing activities continue to highlight and venerate Philippine whose work to open Sacred Heart schools in America eventually led to the founding of Duchesne Academy in 1960. In the Jones Gallery, a photography show titled Visible Philippine opened on November 12. The show features works by Duchesne and Regis faculty and staff that showcase how Philippine left her image on the world. There are artful photos from her birthplace in France, locations from her journey in the southern United States, and images of her influence and inspiration today. The show will be on view through January 30, 2019. On Tuesday, November 13, the entire student body, along with faculty and staff, gathered for an all-school Mass in honor of Philippine. The Mass opened with a video about Philippine as the call to worship. The video (watch it below) featured interviews with resident RSCJs Sr. Sharon Karam and Sr. Ann Caire, as well as Head of Conference Sr. Suzanne Cooke. 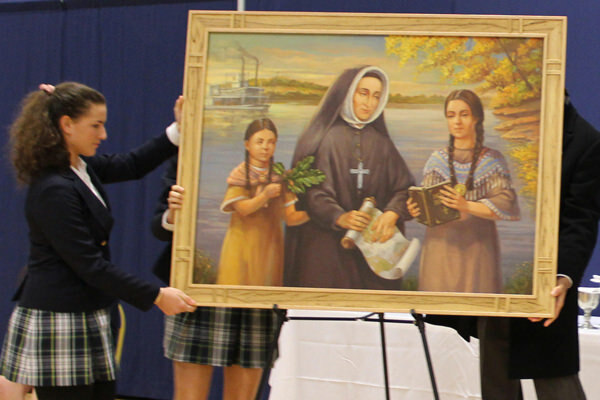 At the end of the Mass, Duchesne unveiled a new painting of Philippine that will be hung in the hallway. The painting was commissioned especially for Duchesne and portrays Philippine with two Potawatomi children. In the background are reminders of Philippine's long journey—the Mississippi River and the Franklin Riverboat on which she traveled from New Orleans to Missouri. The frame is crafted from oak taken from the original oak tree that stood in front of the White House. The painting will hang in a prominent place on campus near the dining hall.